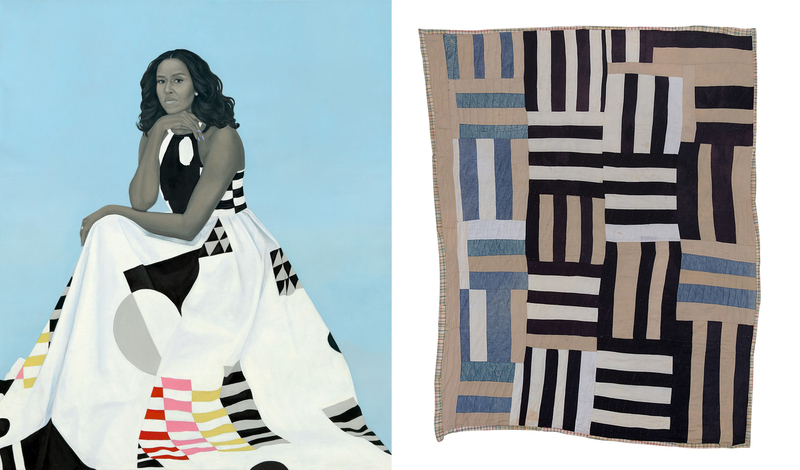 Last week I was intrigued to read that Michelle Obama’s choice of dress in her official portrait as First Lady might be an homage to the quilters of Gee’s Bend. I first wrote about these artworks in 2009, and fell so much in love with them that when I was researching Joyful, I decided to make a trip to Alabama to meet some of the quilters and see where they live and work. It was a fascinating visit, and since I was only able to include part of what I learned in the book, I thought I’d share a bit more here. Even if you’re not familiar with Gee’s Bend, you can probably see just by looking that these are no ordinary quilts. They flout traditional principles of order and symmetry, yet they have an undeniable sense of balance. Gee’s Bend quilts have been hailed as abstract artworks on a par with many paintings that hang in contemporary art museums. They could be easily compared with the work of Ellsworth Kelly or Paul Klee. 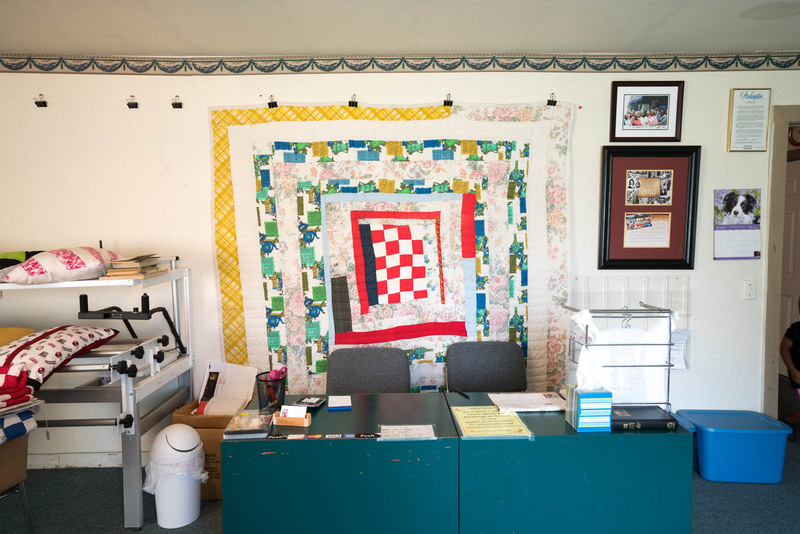 And since a collector named William Arnett began to draw attention to them in the 1970s, the quilts have garnered attention and praise, some selling in the tens of thousands of dollars. Yet these works of art are all the more remarkable because they didn’t come out of ateliers run by professional (mostly white) male artists with assistants and generous commissions. They were created by African-American women, mothers and farmers and laborers, many living in wrenching poverty, who designed their quilts in their heads while picking cotton, shelling beans, feeding, dressing, and chasing after children. For these women, quilting was both a practical necessity and a joyful escape. It is also one of the most intimate forms of art. 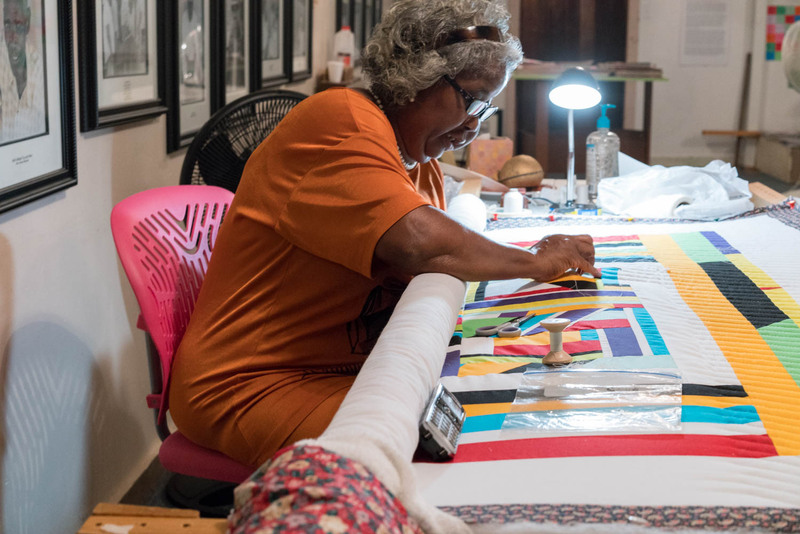 As collectors William and Paul Arnett write, “the quilt safeguards the body during its greatest vulnerability, sleep.” Many Gee’s Bend quilts were made from old clothes, and as such they kept memories of loved ones alive long after they were gone. They were almost like a precursor to a scrapbook, yet one that is an indispensable part of daily life. Many of the original generation of quilters have passed away, and their kids have moved out to cities like Mobile and Montgomery. 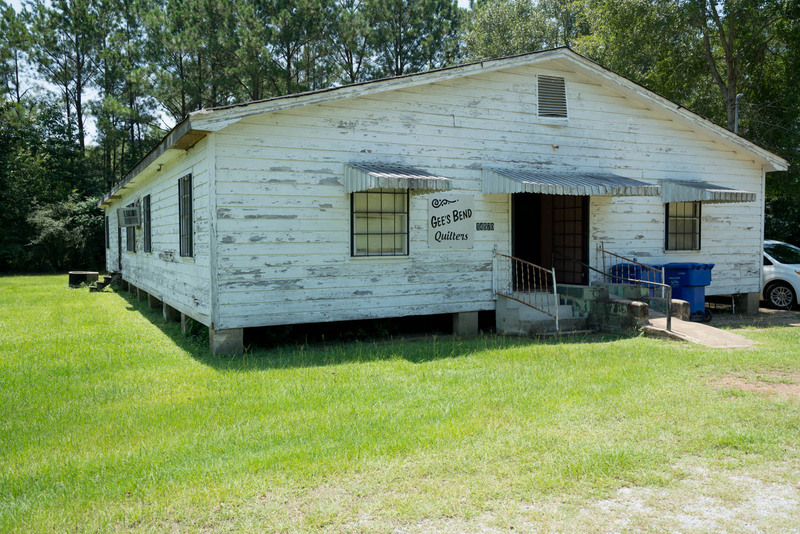 The town, now known as Boykin, had a population of 275 at the last census, and I’d be surprised if it’s even that now. Still, there is a group of quilters who carry on the tradition. 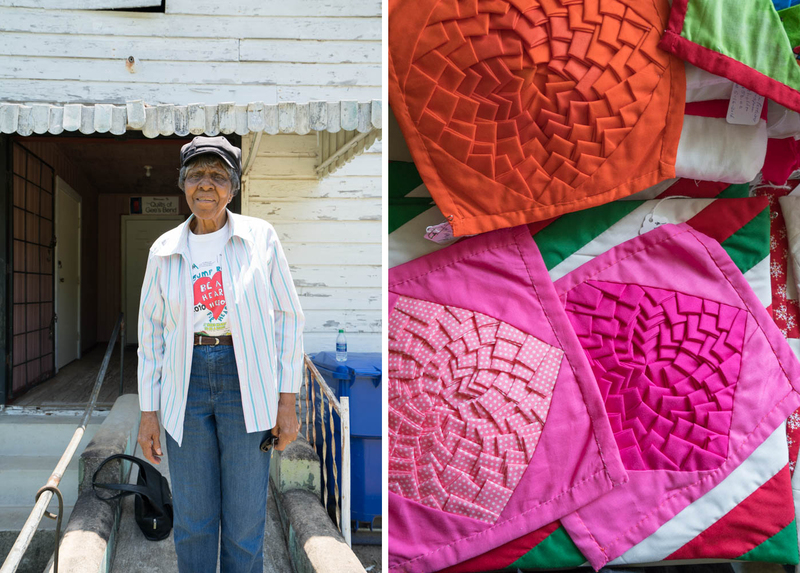 I arranged a visit with Mary Ann Pettway, the manager of the Gee’s Bend Quilt Collective. It’s hard to miss the Quilt Collective, a big white building to your left as you enter the town. Mary Ann wasn’t there yet, but another quilter named Nancy Pettway kindly kept me company while I waited. She offered me a remedial education in quilting (and kindly didn’t quiz me on what I managed to retain! ), using the quilts on the walls and racks to talk me through different approaches. She prefers to quilt by tearing, rather than cutting, pieces of fabric, which lends both ease and unpredictability to the process. After awhile, Nancy had to head down to the Boykin Nutrition Center, where quilters sometimes work together, and invited me to come along. There I met another quilter, Lucy Marie Mingo, who was 84 years old. Mingo treasures her labor-intensive Pine Burr quilts, which have a three-dimensional texture not unlike that of a pinecone, and sometimes take up to six months to make. She learned how to make them from her cousin, another quilter named Pinkie Pettway. 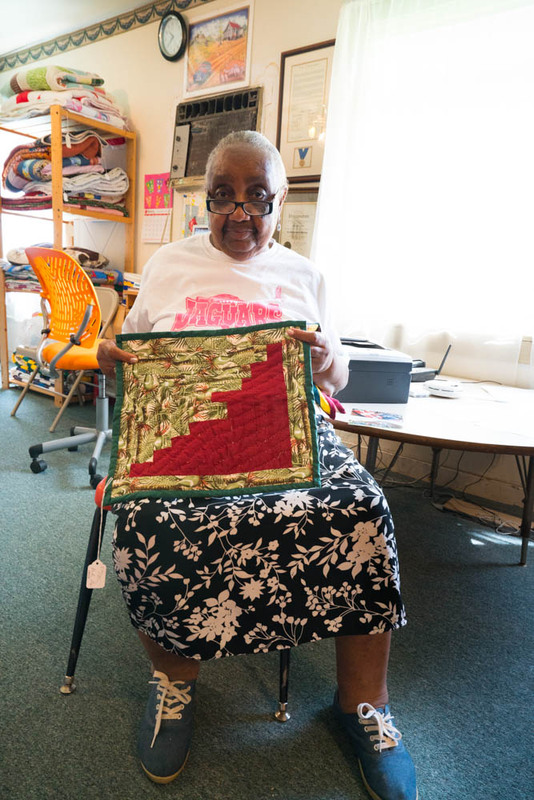 The first time she saw a Pine Burr quilt, she says, “I loved it so, I couldn’t leave.” So she came back the next day with some pieces of fabric and Pinkie taught her how to make it. Still, Mingo also appreciates the undemanding nature of string quilts, which are made from bars of fabric, often laid side-by-side in a loosely striped arrangement. 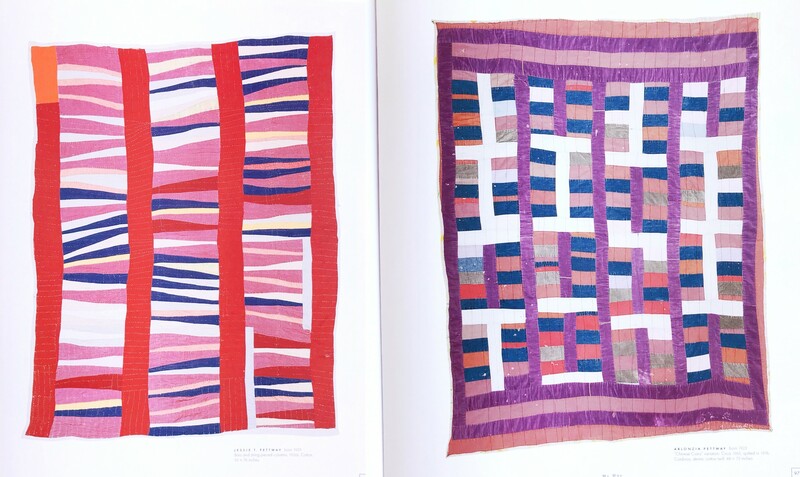 (The red, pink, and violet quilt by Jessie T. Pettway, shown above, is an example of a string quilt.) “You can just take a string quilt and tear the strings like you want ’em,” she said. “As I say, rip and sew,” Nancy chimed in. After spending a little while at the Nutrition Center, I headed back to the collective. Mary Ann Pettway was there, working on several different quilts, and she was kind enough to let me look on as she pieced a new section together. 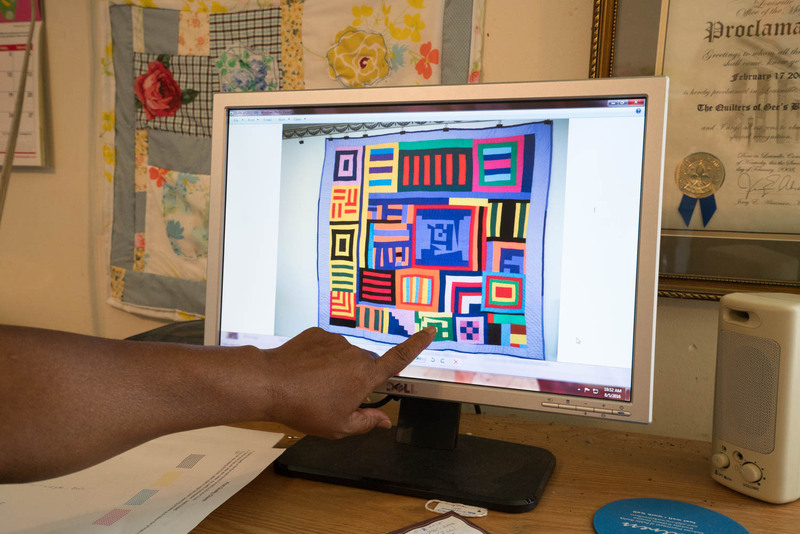 Her aunt is Mary Lee Bendolph, one of the most famous of the Gee’s Bend quilters (whose story is worth a click through, if you have the time), and looking at their work together you can immediately see the resemblance. Both quilters have an energetic style that feels active and alive. “Little small pieces, you can’t hardly see ‘em!” said Mingo with admiration, describing Mary Ann’s technique. Watching Mary Ann take pieces from a pile and fit them into a composition, I felt a bit of the same thrill as when you snap a jigsaw puzzle piece into place or, in a very mundane example, see a Tetris piece lock neatly into its spot. It was a process of making order out of disorder, of finding harmony in what seems to the naked eye like noise. I think it helps explain why these quilts feel so joyful. 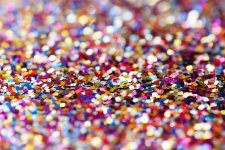 The human eye has an uncanny ability to detect patterns and find balance, even within milliseconds of seeing an object or artwork. We often think of balance as equivalent to symmetry, and symmetrical objects are often delightful. But even when a composition is asymmetrical, our brain can unconsciously detect whether or not it is balanced. Some researchers call this property dynamic balance, perhaps because it feels more active than a purely symmetrical design. We find joy in looking at these quilts I think because they create an unlikely sense of harmony: they look quirky and spontaneous, but underneath that whimsical appearance is a joyful sense of balance, and this combination is deeply satisfying. While I was there, Mary Ann showed me a picture of a quilt the collective made for the Obamas in 2008. She proudly pointed out the three squares she had made in the vivid composition. While it’s not clear if Michelle Obama intended to reference Gee’s Bend with her choice of gown for her official portrait painted by Amy Sherald, or whether it was just coincidence, there’s a pleasure in seeing an echo of these artworks, whose purpose is not about bringing joy to the rarified space of an art museum, but rather to the cozy spaces of everyday life. Visit: find more information on visiting Gee’s Bend here. Images: Header image, from left: “Thousand Pyramids” Variation, Annie Bendolph; Housetop, Lucy T. Pettway; Medallion, Loretta Pettway; Housetop, Qunnie Pettway; courtesy of Souls Grown Deep Foundation / Stephen Pitkin. Top image: Portrait of Michelle Obama, Amy Sherald, and “Roman Stripes” variation, Loretta Pettway. Second image: Bars and String-Pieced Columns, Jessie T. Pettway, and “Chinese Coins” Variation, Arlonzia Pettway. All other images by the author. If you liked this post, you can read more about the Gee’s Bend quilters in my book Joyful, out September 4th from Little, Brown. Sign up here for updates!